A drink inspired by walking the dog, memories of being in a circus and the adventures of a Scottish policeman in Shanghai. It’s Edinburgh and the fourth leg of the Chivas Masters UK journey. Where: Hoot The Redeemer, Edinburgh. Who (competitors): Miran Chauhan, The Bon Vivant, Edinburgh; Milo Smith, 99 Bar & Kitchen, Aberdeen and Andy Stewart, The Tippling House, Aberdeen. 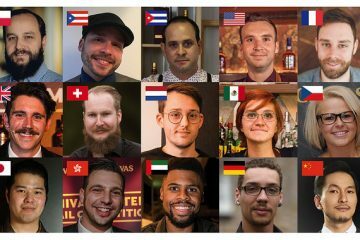 Who (judges): Josh Reynolds, Chivas Masters Global Winner 2015; Matthew Cordiner, Chivas Brand Ambassador, and The Cocktail Lovers. It may have been unseasonably warm and sunny outside, but that was all left behind when we descended the stairs to the delightfully quirky basement bar, Hoot The Redeemer, for the latest day’s action in the Chivas Masters. 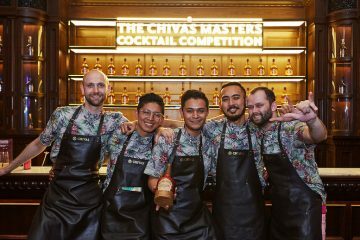 As in all the heats the bartenders were charged with creating three Chivas 12 drinks to represent The New York Way, The Local Way and The Shanghai Way. Miran Chauhan from The Bon Vivant got the proceedings off to a flying start. All three of his creations were intriguing but it was with his first one that he delivered a particularly engaging story. Starting with a variation on the classic Greyhound highball, he was inspired by the walks he took along the beach with his dog to create his drink Race Day. Adding a little sea water, collected from one of these walks, into the drink worked particularly well alongside the Chivas 12, and the experience was further enhanced with a seaweed garnish that nicely brought the aroma of the sea to the room and especially the drink. Milo from 99 Bar & Kitchen claimed the quote of the day nonchalantly remarking during his presentation “I used to work in a circus”. Whilst we weren’t in for a high wire act or fire-eating there was a reason for the comment. The circus in question had been just outside New York and it was there that he first came across the Bijou cocktail. Twisting the original with the introduction of a little coffee to his Amber Bijou made for an intriguingly extra bitter take on the drink. It was Andy from the Tippling Room who took the honours though, with a measured style and three engaging stories. The New York Way produced a twist on the New York Sour which he named the A.P.B. taking inspiration from the 1980s band of the same name. Accompanying his preparation to their music he got to work. His sour included a donut syrup, while the red wine which normally tops the classic version of the drink was replaced with a stout reduction, the two elements combining nicely with the Chivas 12 to extremely good effect. Key to the next drink, Old Fashioned Loon, was a ‘rowie’. This, explained Andy, was a savoury Scottish bread roll particularly popular in Aberdeen. From this he had made rowie-washed Chivas, to which he added a lapsang souchong syrup for a complex and delicious drink. Andy’s final serve was inspired by the story of a fellow Aberdeen born Scot by the name of Willie Kay. Joining first the Scottish police he later travelled to Shanghai to become a member of the local force. His journey continued with the outbreak of World War Two when he returned home to join up with the Gordon Highlanders. But his adventures weren’t over, finally returning again to Shanghai where he spent the remaining years of his life. As a tribute to a strong, determined man that Andy clearly admired, he blended the Aberdeen and Chinese elements of the story, mixing the Chivas 12 with poppy liqueur to create Willie Kay’s Cup. Sweet with floral notes and extremely appealing. Andy Stewart, Chivas Masters Edinburgh Heat Winner, with his cocktails, (L-R): Willie Kay’s Cup, Old Fashioned Loon and A.P.B. “The level was very high in the Edinburgh heat and Andy is a great winner. He had a good depth of Chivas knowledge. I also particularly liked his story for The Shanghai Way which was pretty amazing! I wish him all the luck in the final. ” Josh Reynolds, Chivas Masters Global Winner 2015. 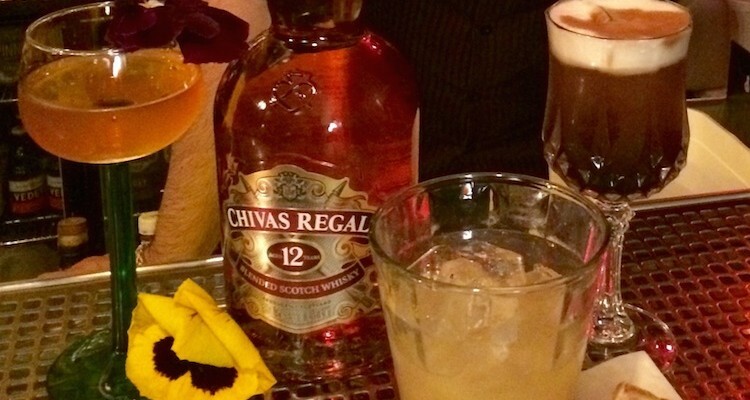 “Andy encompassed the history of Chivas really well in his drinks. He also brought a nice touch to his cocktail for The Local Way by using an Aberdeen rowie in very original way as a syrup.” Matthew Cordiner, Chivas Brand Ambassador. “There were some very good drinks served up from all the contestants, but Andy stood out by delivering with all three of his creations. Moreover he was also a natural story-teller and delivered a particularly engaging performance.” The Cocktail Lovers. “It was absolutely fantastic to be able to weave in a tale about Chivas, one of Aberdeen’s greatest exports, along with other aspects from my home town. 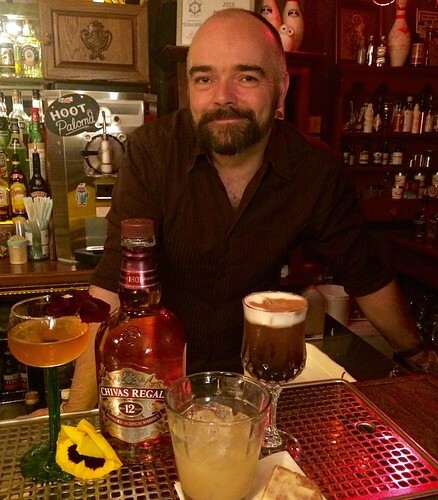 And I’m incredibly excited to make it through to the final and compete against some of the best in the UK.” Andy Stewart, Chivas Masters Edinburgh heat winner. Dry shake then wet shake over ice. Garnish poured on top 20ml dark chocolate stout reduction. Stir, julep strain and serve in a rocks glass. Served with a buttered rowie. Stir, julep strain and serve in a tall stemmed glass. Garnish with an edible flower. Show your bar’s unique team spirit and win not one, but three prizes!